Amazing ledger containing the bylaws of a Seymour and Blair 1868 Presidential campaign club from Louisiana comprising of ex Union sailors and soldiers from the Civil War. 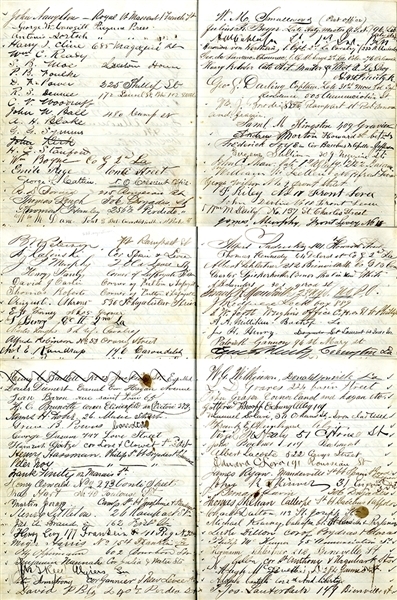 The front and back of the piece were used as a diary in 1883, but the middle pages were used earlier for the formation of the club in 1868. Included, besides the bylaws, are 288 names, many original signatures, of men who served in the Civil War, whether in the army or navy. Each man likley contributed money to the club as well. There are four pages of club bylaws, and thirteen pages of signatures. Some have added their rank and regiment. The addresses are all from New Orleans and the vicinity. The ledger, being soft cover (leather), measures 7” x 8 1/4”. Some who have provided their rank and regiment are William Boyne Co. G 2nd La, Julius Beyers acting master USN, Herman Von Werthern Capt 2nd La Calvary, George Chaunac Sergt 2nd La Vols, George Darling Captain 31st Mass, John Shaw 1st US Infty, Charles Hughes 6th NY Calvary, J.H. Beatty Capt 2nd La, Harry Jones US Signal Corps, Max Schmitz Capt 58 NY, John Skinner 31 Engineers, George Mull 2nd La, Jacob Gray 3rd US Artillery, A Combe 26 MO volunteer, Sam Mconnell 62nd reg Zouaves ?. The others, who all served the Union, have not added their rank or regiment, and are worthy of further research. A fantastic piece of political and Civil War history.